Laramidia was an island continent that existed during the Late Cretaceous period (99.6–66 Ma), when the Western Interior Seaway split the continent of North America in two. In the Mesozoic era, Laramidia was an island land mass separated from Appalachia to the east by the Western Interior Seaway. The seaway eventually shrank, split across the Dakotas, and retreated towards the Gulf of Mexico and the Hudson Bay. The masses joined to unite the North American continent. Laramidia stretches from modern-day Alaska to Mexico. The area is rich in dinosaur fossils. 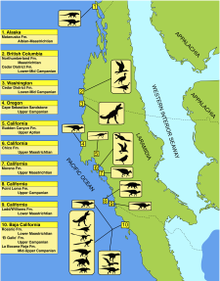 Tyrannosaurs, dromaeosaurids, troodontids, hadrosaurs, ceratopsians (including Kosmoceratops and Utahceratops ), pachycephalosaurs, and titanosaur sauropods are some of the dinosaur groups that lived on this landmass. From the Turonian age of the Late Cretaceous to the very beginning of the Paleocene, Laramidia was separated from Appalachia to the east. As a result, the fauna evolved differently on each land mass over that time. Geological conditions were generally favorable for the preservation of fossils in Laramidia, making the western United States one of the most productive fossil regions in the world. Less is known about Appalachian biodiversity in the Cretaceous as few fossiliferous deposits exist in the region today and half of the fossil beds in Appalachia were destroyed during the Pleistocene ice age. However, fossil beds which haven't been discovered yet could exist in areas of the former Appalachian continent. In western North America during the Cretaceous the dominant theropods were the tyrannosaurs, huge predatory dinosaurs with proportionately massive heads built for ripping flesh from their prey. In Laramidia there were the theropods of Tyrannosaurinae such as Tyrannosaurus rex, Nanuqsaurus hoglundi,  Daspletosaurus, Teratophoneus, and theropods of Albertosaurinae such as Albertosaurus and Gorgosaurus, all being included under the same family of Tyrannosauridae and not all contemporary. The bodies of tyrannosaurs exhibited huge heads and legs, in contrast to proportionally tiny arms. The teeth exhibited in this family are rather comparable to railroad spikes and would have helped inflict major damage on prey. Another common group of North American dinosaurs were the hadrosaurs. The fossil record shows a staggering variety of hadrosaur forms in Laramidia. Other differences in genera appear between the island land masses. Sauropods roamed Laramidia during the Cretaceous after apparently dying out in Appalachia. Nodosaurs, though, appear to have been more plentiful in Appalachia. Nodosaurs were large, herbivorous armored dinosaurs resembling armadillos. They were scarce in Laramidia by the late Cretaceous, existing only in specialized forms like Edmontonia and Panoplosaurus while nodosaurs were thriving in Appalachia. ^ Archibald, J. David (1996). Dinosaur Extinction and the End of an Era: What the Fossils Say. New York, NY: Columbia University Press. ^ "Amazing Horned Dinosaurs Discovered". MSN. 23 September 2010. Archived from the original on 2010-09-26. Retrieved 23 September 2010. ^ a b Sampson, Scott D.; Loewen, Mark A.; Farke, Andrew A.; Roberts, Eric M.; Forster, Catherine A.; Smith, Joshua A.; Titus, Alan L. (2010). "New Horned Dinosaurs from Utah Provide Evidence for Intracontinental Dinosaur Endemism". PLoS ONE. 5 (9): e12292. Bibcode: 2010PLoSO...512292S. doi: 10.1371/journal.pone.0012292. PMC 2929175. PMID 20877459. ^ Rozell, Ned (10 February 2005). "Shedding light on Arctic dinosaurs, Alaska Science Forum, Article #1737". Geophysical Institute, UAF - Alaska Science Forum. Archived from the original on 2012-04-04. Retrieved 14 November 2011. ^ "Dinosaurs on Alaska's North Slope". Bureau of Land Management: Alaska. U.S. Department of the Interior. 30 May 2008. Archived from the original on 2011-11-10. Retrieved 14 November 2011. ^ Fernández, Hilda (3 October 2014). "Hallan en Coahuila cementerio de dinosaurios". El Universal (in Spanish). Mexico City. Retrieved 25 April 2015. ^ Fiorillo, Anthony R.; Tykoski, Ronald S. (12 March 2014). "A Diminutive New Tyrannosaur from the Top of the World". PLoS ONE. 9 (3): e91287. doi: 10.1371/journal.pone.0091287. Retrieved 24 August 2018.